This is an EP that showcases a band that are flying high. Whether on natural substances or synthetic is irrelevant, the songs on Mandarin Time manage to transfer a body high to listeners, enabling them to get a glimpse of the view that The Good Sports are experiencing. I’ve been looking forward to this release for a while and it’s finally here. The Good Sports are a Brisbane favourite thanks in part to their frenetic live show and the over the top braggadocio of their members. Their music is loud and their music is fun, a refreshing change from the seriousness of many heavy psych bands around now. This band smiles, and you smile with them. Their debut EP, Mandarin Time is a great foray into the minds of The Good Sports themselves. The music seems to swirl around in a haze of blissful confusion – like the band are aware that something strange is happening but keen to see where it all leads rather than fight it. I guess it’s thematically consistent with psychedelic tropes that there is a haze saturating this record, so what do The Good Sports do that separates them from the rest of Australia’s psych enthusiasts? First off, I think The Good Sports are interested in pushing the accessibility of psych – they have fun on stage and on record and aren’t getting caught up in the notion that psychedelic sound is all about dense sound scapes and repetitive monotony. 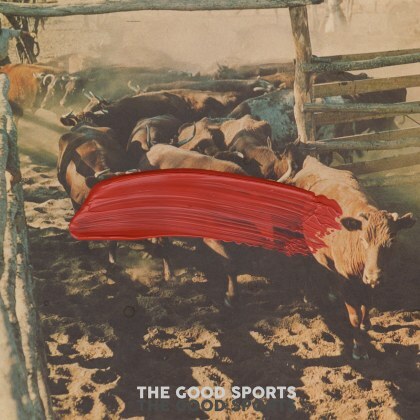 The Good Sports are also quite insightful and are well aware that their music documents an excessive lifestyle. There is a lot of self-referential emotionality for a band this scrappy, which is good to see. Vocalist, Nash Johnston is a charismatic front man, pulling off garage-punk swagger and guitar jazz hero simultaneously, yet it’s his lyrics that provide poignancy to music not often familiar with that term. Elements of uncertainty and paranoia are littered throughout Mandarin Time yet are ably passed off in such away that communicates that the band are still enjoying the high life, confusion and all. This is an interesting dichotomy that I’d love to see explored further in future releases. This is an EP that showcases a band that are flying high. Whether on natural substances or synthetic is irrelevant, the songs on Mandarin Time manage to transfer a body high to listeners, enabling them to get a glimpse of the view that The Good Sports are experiencing. From that high up the world looks small, hopefully that encourages the band to keep thinking big and creating bigger.